Recent estimates suggest that there are 25 million meetings a day in the US and, at their core, all aim to create meaningful interactions among teams that foster collaboration, speed up communication and ultimately propel the group toward accomplishing a common goal. To ensure that these objectives are achieved, enterprises must leverage various forms of technology in an attempt to make the most of meeting room spaces. It’s crucial, however, for organizations to take the impact of space, available technology and how attendees will be interacting into account as they outfit meeting spaces with the proper tools to maximize results. One of the most commonly used tools in the meeting room today is displays. They come in various forms, be it projectors, flatpanels or alternative interactive display solutions. However, their ultimate impact can be linked directly to the optimal display size appropriate for a given space and how the display will impact a user’s visibility and readability experience. It’s important to note that human interaction in each type of meeting room, be it a large auditorium, training room or huddle space, differs greatly and the activities attendees participate in, and concepts they ultimately take away, are directly related to the room and display size used. 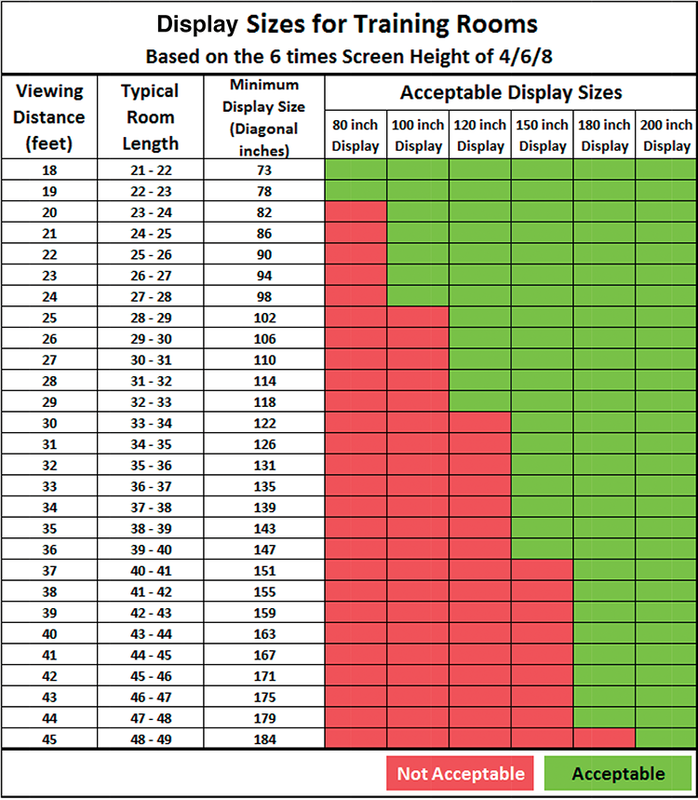 Fortunately for those looking to appropriately outfit their meeting workspaces, there are two methods to determine optimal display size: 4/6/8 and the Desktop Equivalent Visibility (DEV) method, both of which yield favorable results. However, each has differing applications for large conference rooms and auditoriums, classrooms and training rooms, and small and medium-sized meeting rooms and huddle spaces. 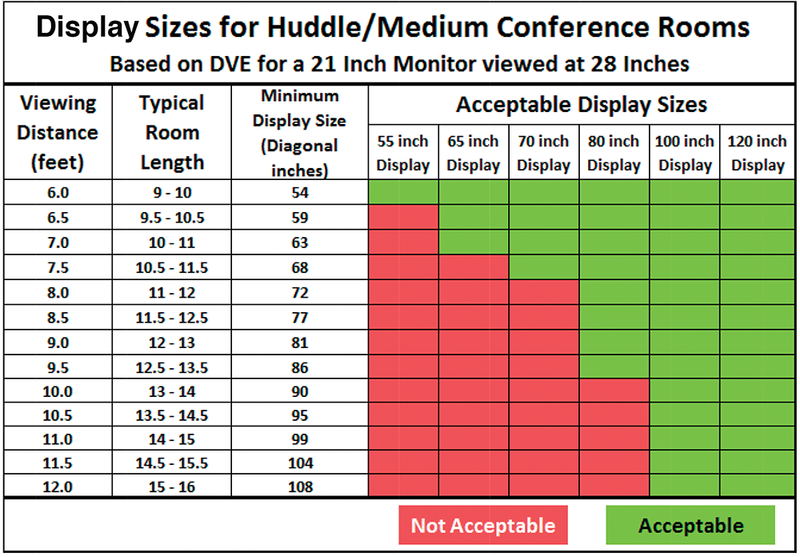 The AV industry accepts the 4/6/8 Rule as the standard for determining display sizing for viewing distances. Under the 4/6/8 Rule, a minimum display size is recommended for the maximum distance participants will be from the room’s display. Depending on the type of content presented and the anticipated interaction with the content, meeting attendees should sit no farther from the display than four, six or eight times the display’s vertical height. The rule identifies three different types of content with varying densities and correlated participant interactions that dictate which of the four, six or eight times calculations is applicable. Maximum 4x Vertical Display Height: The viewer of this material is analytical and fully engaged with the details of the content. It’s possible to make critical decisions and effectively analyze details within the displayed image. Maximum 6x Vertical Display Height: Viewers are able to make basic decisions from the image presented because the decisions are not dependent on critical details within the image. 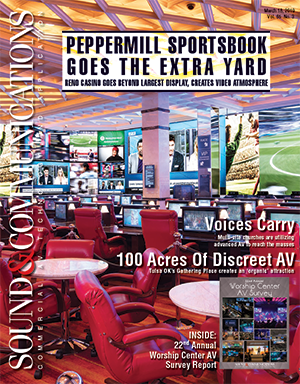 Fonts are typically larger and intended for group viewing. The viewer can recognize what the images on display are and can separate text from image because the content doesn’t require assimilation and retention of detail, but a general understanding. Blending the visual guidelines mandated by the Occupational Safety & Health Administration (OSHA) with the well defined standards of ophthalmologists and industry organizations, DEV uses a comparison to an employee’s individual ideal ergonomics desktop experience and transfers it to the group meeting space. DEV is largely based off of the Snellen vision chart, which sets 20/20 as the visual norm, meaning the line for 20/20 vision is a specific size that the average person can discern when 20 feet away from the image. For 20/40, the mathematics can be simply interpreted to mean that, if you’re twice as far from the image displayed, the image displayed has to be twice as large for equivalent visibility. 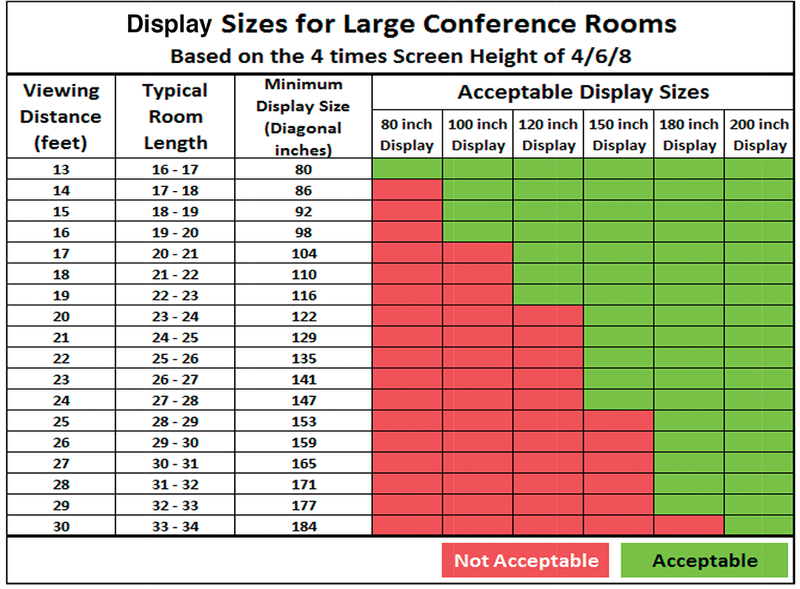 Given that the average personal computer display is 21 inches and workers view the display from 28 inches away (on average), DEV dictates that the ideal conference room will have a display experience that replicates the viewing experience when using a 21-inch or larger desktop from 28 inches away or less. 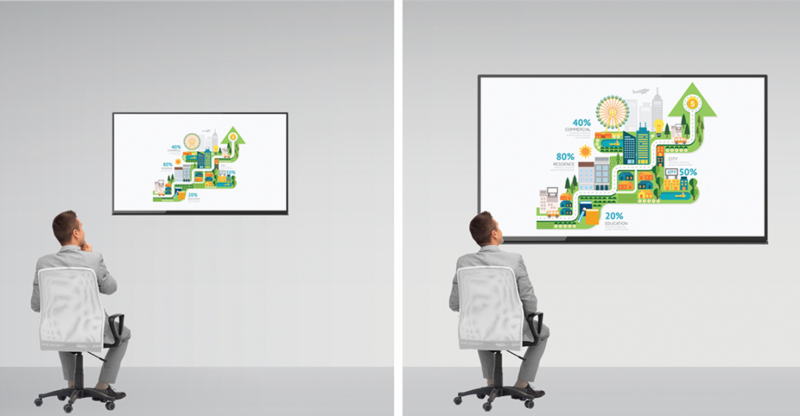 Generally speaking, smaller conference rooms and huddle spaces requiring active participant collaboration should use DEV, and larger conference rooms and auditoriums work best with the 4/6/8 Rule to determine the optimal display size. Although there are occasional outliers, taking into account the meeting’s objectives and the ways in which the displayed content is meant to be digested and interacted with by participants will produce the best viewing experience.